A thing I think happened: One day the People In Charge Of Ideas were sitting around at Volition racking their brains trying to come up with a new Saints Row game. "What can we possibly do to top the last game?" said one developer. "We literally gave players superpowers last time and put them in an entirely virtual world! There was a dubstep gun. It's impossible!" Then a letter showed up at Volition HQ. "Dear Volition, Your games are obscene and you're all going to hell." "Eureka!" shouted a developer who was, for some reason, dressed like a California prospector. And thus was Saints Row: Gat Out of Hell birthed from the depths of Satan's womb. Johnny Gat living up to his name. First off: If Meat Loaf isn't in this game, I'm going to riot. Or send a strongly worded email to Volition. That said, Gat Out of Hell is a hell of a lot of fun. Your character from the previous Saints Row games, "The Boss/Mr. President," gets sucked into the underworld by a rogue Ouija board, so Johnny Gat and Kinzie go after him. You play as Gat himself, with a giant pair of demon wings affixed to his back. Your job? To piss off Satan and get The Boss back. 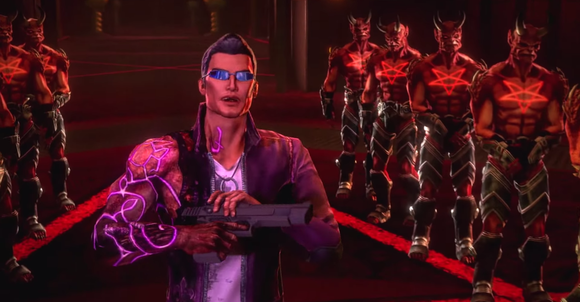 Gat Out of Hell isn't a full Saints Row game, but a standalone expansion for Saints Row IV. The game does not take place in Steelport, though, unlike previous Saints Row IV expansions. Volition and co-developer High Voltage Software have designed an entirely new Hell map, approximately half the size of Steelport, and it's full of all sorts of strange things. Creepy floating islands? Check. Gothic-style castle? Check. Pirate shipwreck? Check. Gat's wings aren't just decorative, either. 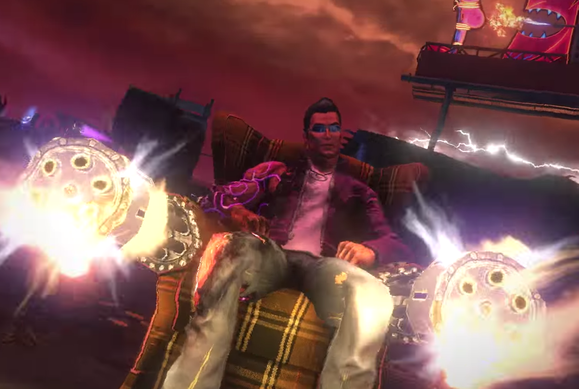 The flight system from Saints Row IV has been overhauled, allowing you to soar around Hell in style. I was told by a Volition rep that the new map was designed specifically with verticality in mind—he said Saints Row IV never quite accomplished what the team wanted with flight, due to the reuse of a map designed for Saints Row III's car- and foot-oriented travel. Due to the lack of any story objectives in the demo I played, I mostly just flew around. It felt great—highly responsive. Flying Top Gun-style near the ground also earns you experience for "barnstorming," so I spent a lot of time buzzing the streets and acting like an idiot. I enjoyed Saints Row IV, but the reuse of Steelport's map felt like it constrained some of the superpowers and made them less interesting than they might've been if included from the start. The new map really feels like it's let Volition loose, and that's appreciated. There aren't any people in Hell, as far as I can tell. Instead, tortured souls and other demons roam the streets, and they all seem to hate you. You've got an array of weapons to deal with said demons—everything from a hammer that throws enemies into the air on contact to a gun that shoots (I kid you not) locusts. And wait—did I mention that there's a La-Z-Boy recliner that shoots rockets every time you recline? You can just sit down in it, ride around, and shoot rockets. This isn't some sort of special weapon, or a vehicle you get into. It's part of your standard weapon wheel. If you didn't think the dubstep gun was crazy enough, wait until you see this. 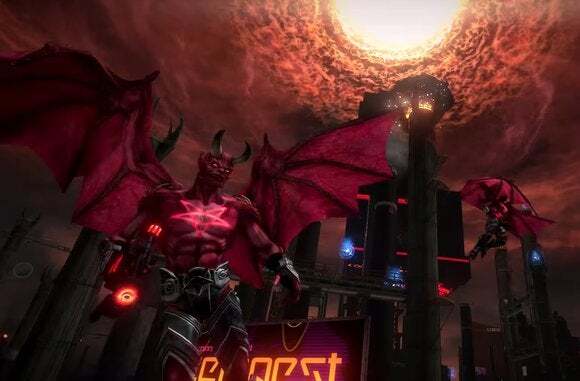 Saints Row: Gat out of Hell lets you sling lead and rockets while you take a load off. All I did was play ten minutes and I'm already pretty sold on Gat Out of Hell. It seems to combine the best aspects of Saints Row IV (flight and insane weapons) with a map that's more tailor-made to take advantage of those aspects. Plus if it's actually half the size of Saints Row IV, it's a steal at the $20 Deep Silver is asking. Unfortunately we won't see Gat Out of Hell this year—the game's scheduled to release January 27, 2015. Unless you make a deal with the devil, I guess.